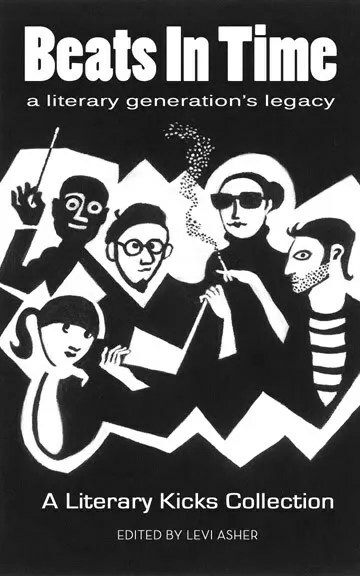 Photographer Larry Keenan was there to chronicle the great transition from the “Beat Generation” to the “Hippie Generation” – taking pictures of artists, musicians, and scene-makers like Allen Ginsberg, Neal Cassady, Bob Dylan, Michael McClure, Timothy Leary, Ken Kesey and the Merry Pranksters, Lawrence Ferlinghetti, and more. Many of these photos are in the permanent collection of the Archives of American Artists in the Smithsonian Institution, Washington, D.C. That’s enough to make me a big fan, but Keenan has done much more. He is called a “digital pioneer” in the Random House book Digital Photography and has produced a line of Fractal greeting cards. He was featured on the PBS television program Computer Chronicles digitizing and creating the award winning package cover of Deluxe PhotoLab for Electronic Arts using the Amiga 2000 computer system. His photographs are in museums and private collections throughout the world. Keenan has received numerous awards and his photographs have appeared in ad campaigns, corporate and professional publications, CD and record albums, books, magazines, and software packages. On top of all that, and to my delight, he is friendly and easy to talk to. Bill Ectric: How old were you when you started taking photographs? Larry Keenan: I started in the 7th grade. In those days, I wanted to be a cartoonist and/or animator. My grandfather made me an animation box with the back-light, etc. I drew all the frames for my 3-minute movie. I used my parents 8mm movie camera to film each frame. It worked – the film was in real animation. My parents took us to the opening of Disneyland that summer. While we were down there, my dad had a friend who knew guy in Disney’s orchestra. He arranged for me to take a private tour to visit the Disney Studios. There, I met some unhappy animators, who all told me to do something else. They told me that they were all trapped into doing only their specialty, which might be water, clouds, trees, flowers, etc. They told me there was no variety. When I got back home, a painter at my parent’s remodeled kitchen used to work at DC Comics. He was not encouraging either. I needed variety and I already knew what being trapped was like, living at home. I ended up charging my friends a buck a signature and began signing report cards using my animation box. My first still images were underwater photos I shot with a camera I bought and I used an underwater case I had made for it while in the 9th grade. Bill Ectric: How did you get involved with photographing the beats, hippies, and other counter culture icons? Larry Keenan: I had Michael McClure for a teacher at California College of Arts and Crafts. After taking a couple of classes with him, I had great respect for his amazing knowledge and intelligence. I was doing a project with a few friends at school and it was going to be published. I got involved with the project because I wanted a real published piece in my portfolio. A lot of the hypothetical crap in everyone’s portfolio at school was pretty bad. Because my parents were against me going to art school (although they supported me in it), I had a real drive to make it, to be the best I could be. I asked Michael to be our faculty sponsor for our project and he said yes. We met at his house in the Haight in 1964. After the meeting, while we were going out Michael asked me if I would like to photograph some of his friends. I asked him who his friends were and he answered with a list that included Ginsberg, Ferlinghetti, Kesey, Conner, etc. After we got outside, a friend said “going up.” For the next year or so, I photographed the end of the Beat scene. McClure and Ginsberg gave me the access but my honesty, skill and professionalism kept me in good graces with all concerned. Then the Haight-Ashbury and the hippies came out of the Beat movement, so I was well placed to continue shooting the counter-culture. I caught the cultural transition in photographs and that is my legacy. Bill: Any particular memories about Ginsberg, Dylan, or anyone from that scene? Larry: All memories from those days are positive. I was treated with respect by the Beats. They were very nice to me, besides they were receiving mounted 11×14 prints every week. I would go to a party with McClure and people would come up to me and ask who I was. I would tell them I was nobody. To my surprise they would say, “No man, you have to be somebody, you came here with McClure.” My only bad experience was when I was shooting Dylan in the City Lights alley. I brought 2 cameras, one for me, and one for a girlfriend of mine. It is long story but to keep it short, she did not come to the session. In the frenzy of the shoot, with the crowd being kept at bay by Ginsberg, I used the camera I brought for her. It had no film in it (she was going to use her own film). When it seemed as if the end of the roll would never come, I realized there was no film in the camera. It said #40 on the film counter and I knew it should only be #36 if there was film in the camera. The first camera was hurried work because I did not know how long we were going to be able to work with these cats. My best stuff was with the camera without film (when I was calmer). Bill: I know that Dennis Hopper is into photography, and I know you have taken pictures of him. Has he ever asked you for tips or advice? Larry: No, he does not need my help. He is a very good photographer and artist. Bill: This question is off-the-wall, but I’ve always wanted to ask someone who is an expert in the field. I once heard a story about a murder mystery being solved because, while the culprit was in the victim’s room, there was a flash of lightning, which burned a photographic image of the killer onto a mirror in the room. Is that possible? Larry: It really depends on what the image looks like. Anything is possible and I share the same philosophy as Marilyn Monroe. We believe a little in everything. Bill: I think it’s fascinating how physics and math is intertwined with nature and aesthetics. Like the Fibonacci number and all. Would you mind talking about that briefly? Larry: I love the fact that art and science go hand in hand. I like how Fibonacci’s number string seems to hit the number of flower petals at least up to 233 or so. Number sequences do not do it for me. Personally, I like how M.C. Escher has worked his art out mathematically. Even more abstract and beautiful are the fractal geometric equations by professors Benoit Mandlebrot and Gaston Julia. The first time I saw a Mandlebrot I recognized it as a primal image. I feel most art is dicks and pussies anyway, so I was not surprised. I have attached two examples each of my Mandlebrot and Julia pieces that I have created in the computer and incorporated into my work. I really loved messing with their calculations to come up with my own work using their math. I did this work on an Amiga 1000 computer in 8 bit. Bill: I read that you have a line of fractal postcards. Can you explain what fractal means? Larry: Fractal geometry (also known as the Chaos Theory) describes the marks and trails left after chaotic activity that do not vary under different magnifications. Examples of these patterns are all around us, from snowflakes, trees, and landscapes to spiral galaxies and their distribution throughout the universe. I have also attached 2 examples to show scenes I created using fractal geometry in 1991 with 8 bit low-res Amiga system. Bill: Do you still teach photography? Larry: Not formally, but I still keep my hand in. I teach a class in pinhole photography in every school my daughter Chelsea has attended (every year). I mentor a couple of artists. One especially is flat-out amazing. Klaus Lange. He is a chef by profession who now works on a pilot ship (as a chef) in the ocean just outside the Golden Gate Bridge. He does excellent impressionistic work with his digital camera shooting the sides of ships. Amazing abstract images. I think his work is way better than Aaron Siskind’s stuff. Type his name into Google to see his work. I would like to teach again, part-time, but I have Parkinson’s. My handwriting is gone and my speech is iffy, although I have recently completed a speech therapy program. I learn a lot by teaching and I miss it. Bill: Would you care to talk about the Parkinson’s disease? Bill: Is light a particle or a wave? Larry: I think it is a wave of particles. All I know is that when I am shooting, I think of light as water. It helps me think of it in real physical terms because of the complexity in lighting a set. Bill: Is jazz musician David Amram a particle or a wave? Larry: He is a laser, a coherent light source. David is a genius, an amazing cat. He is very generous with his time talking to young and old alike. Bill: Do you think digital photography will ever replace film? Larry: I think film is already out, especially in the smaller formats. I have not shot a film job in over two years. I look back on my work and the best reproduced jobs I have seen are from digital files. Bill: Where do you live? Bill: What advice would you give someone who wants to be a professional photographer? Larry: Go to Art school, learn to draw, sculpt and paint. Take psychology, philosophy, portfolio and business classes. Make the computer your friend. Photoshop classes are a real must. No one asks you if you are any good at Photoshop, they ask how long you have been doing it. Like drawing, it is mileage with the pencil. So, put miles on the mouse. Assist a working pro that you respect. Be social, this is where I failed. My special effects projects took so much of my time that I had to do them between marriages. The projects cost me friends because I was working day and night, weekends too. Bill: That also sounds some excellent advice. Thank you. Larry, you’ve been very generous with your time, answering these questions. I want to say again how much I enjoy your work, both the early stuff and the new. I’m anxious to see what you do next! Literary Kicks, a website born in 1994, was there to witness it all, standing at the crossroads of emerging Internet culture and Beat inspiration. Here’s the tale of Levi Asher’s audition for Francis Ford Coppola’s movie version of ‘On The Road’, and John Perry Barlow’s touching explanation of how Neal Cassady inspired the Grateful Dead song “Cassidy” . . . W. S. Merwin and Allen Ginsberg get into a heated argument over forced nakedness as Buddhist prayer, Patricia Elliot describes William S. Burroughs’s funeral in Kansas, and Michael McClure describes, on the fiftieth anniversary of the legendary Six Gallery poetry reading, what it all meant . 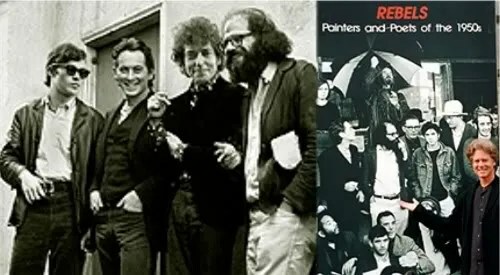 . .
Left: Detail of a photo by Larry Keenan (Robbie Robertson, Michael McClure, Bob Dylan, and Allen Ginsberg). Right: Photo by Lisa Keenan of Larry Keenan in Washinton, DC at the Smithsonian's National Portrait Gallery exhibit, "REBELS: Beat Artists and Poets of the 1950s." This interview took place by email sometime around 2005 or 2006. Larry Keenan: I started in the 7th grade. In those days, I wanted to be a cartoonist and/or animator. My grandfather made me an animation box with the backlight, etc. I drew all the frames for my 3-minute movie. I used my parents 8mm movie camera to film each frame. It worked – the film was in real animation. photos I shot with a camera I bought and I used an underwater case I had made for it while in the 9th grade.